Does your VCT tile floor look dull, dirty, yellow & scuffed and like it has many layers of wax on them? If so, Magic Carpet can help with a thorough VCT Tile Cleaning. 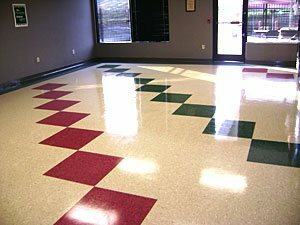 Through a commercial stripping and re-waxing process, we are able to rejuvenate VCT tile to shine like new again. We recommend a maintenance cleaning schedule for commercial properties as well as a daily mopping using a neutral cleaning solution. We sell Neutral Clean by the gallon. If interested, ask our sales associate for details and pricing. Call today for a FREE onsite estimate. We service metro Atlanta including Suwanee, Gainesville, Lawrenceville, Athens GA.